Abstract—Soil contaminated with iron and chromium was planted with Psoralea pinnata under greenhouse condition. The growth of the plants and phytoextraction of the metal contaminants from the soil were studied for a period of three months. The results showed that Psoralea pinnata was able remove both chromium and iron from the contaminated soil during the period of experimentation. The percentage reduction in chromium and iron concentrations in the experimental soil varied greatly at different concentration of both contaminants in the two soils used. It was observed however that at some points in the experiment inv olving mixed concentration of iron and chromium, there were preferences on accumulation of metals by Psoralea pinnata . Results show that chromium was initially most accumulated by Psoralea pinnata (up to 68%). As the c oncentration of contaminants increased, at high concentrations, iron was recorded to have been accumulated more in Psoralea pinnata (up to 55%). Index Terms—Chromium, iron, phytoextraction, Psoralea pinnata. R. O. Ochonogor is with the Department of Environmental Sciences, University of South Africa, P.O. Box 392, Pretoria 0003, South Africa. H. I. Atagana is with the Institute for Science and Technology Education, University of South Africa, P.O. Box 392, Pretoria 0003, South Africa (e-mail: atagahi@unisa.ac.za). 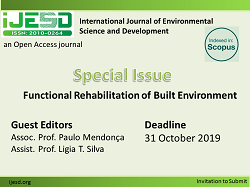 Cite:Richie O. Ochonogor and Harrison I. Atagana, "Phytoremediation of Heavy Metal Contaminated Soil by Psoralea Pinnata," International Journal of Environmental Science and Development vol. 5, no. 5, pp. 440-443, 2014.